The Gimbal EasyRig Vest from Easyrig is a support system built to handle camera rigs and gimbals with a load between 11 - 38 lb. With an adjustment screw located on the back, the EasyRig allows you to adjust the line tension to adapt to many different cameras and configurations. The vest allows you to deliver the same steady hand-held shots, while relieving strain on your back, neck, and shoulders. The load is redistributed to the hips, allowing you to shoot hand-held in comfort for long periods of time. Supports Weights 14lbs. and 44lbs. 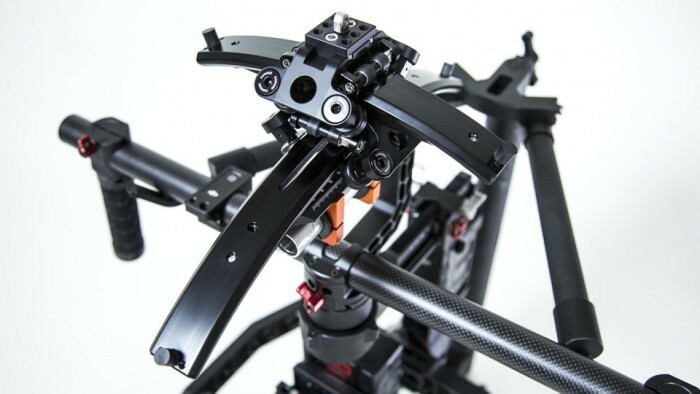 The FLOWCINE Serene is a two-axis spring arm stabilizer that attaches at the end of the Easyrig. It smooths video results by mitigating vertical vibrations induced by walking or running during a tracking shot. It also stabilizes side to side motion in similar tracking situations by counter-pivoting around its center axis. The Serene also allows for full use of the Easyrig spring extension for going from high to low mode. The patent pending 2-axis Puppeteer is an anti-vibration mount made to eliminate the motion coming from the Easyrig cord while walking or running. It stabilizes around two axis, roll and tilt, and at the same time allows you to easily tilt your gimbal when shooting in follow- or majestic mode, removing disturbing string force from the Easyrig cord. 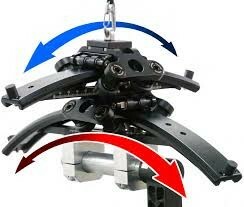 Made from the best materials and bearings on all critical pivot points, the 2-axis Puppeteer ensures a frictionless and smooth operation, removing disturbing motion in both the tilt and roll axis. 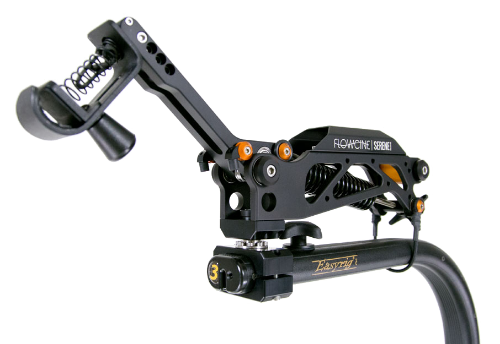 The 2-axis Puppeteer can also mount on a Steadicam arm or a hard mount. EasyRig with Serene Extension Arm and Puppeteer IN ACTION!